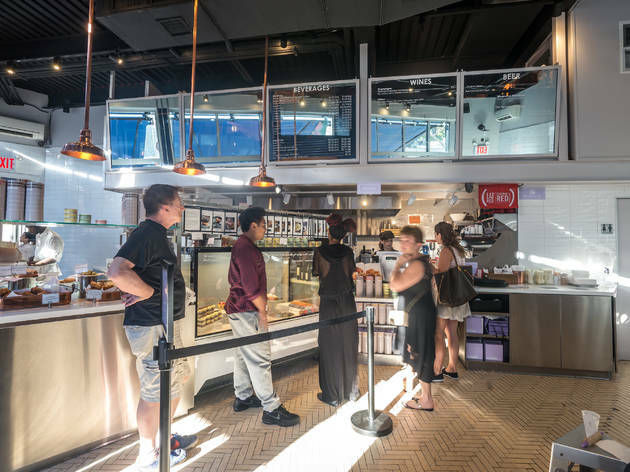 Dominique Ansel not serving Cronuts is like Mick Jagger not singing “Satisfaction”—you risk losing the crowd if you don’t deliver the hits. 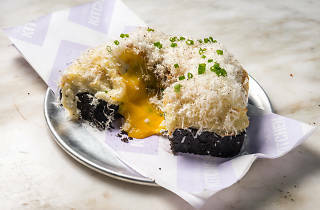 But with a back catalog as extensive and worthy as Ansel’s, it wasn’t all that earth-quaking when the pastry icon announced he would be favoring deep-cut desserts over that croissant-doughnut phenom at Dominique Ansel Kitchen, the sophomoric effort to his hysteria-inducing bakery in Soho. 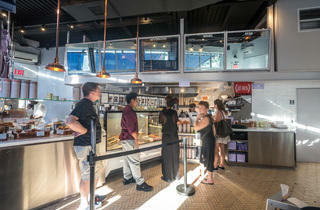 The counter-service West Village follow-up is more spacious than the pint-size original, with a wooden pyramid of stadium seating in a corner, a large retail counter overlooking the kitchen and a handful of bloom-potted benches outside. But there are no iPhone-primed lines to be found here—that’s because the work Ansel’s doing is more quietly radical than the hammy Wonka–fied hybrids on the lips of every tourist. 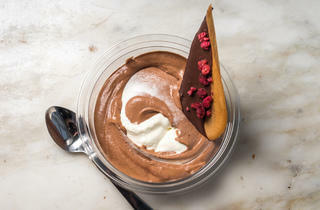 Cookie-milk shots and frozen s’mores have been traded for nipped-and-tucked classics, most of which are made to order, like velvety chocolate mousse folded à la minute ($6.50). 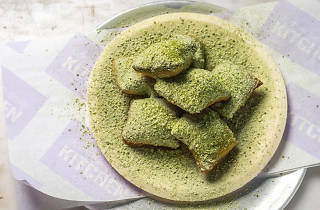 Upon first bite, the fresh-from-the-fryer mini matcha beignets ($5.50 for six) are a touch too bitter—that is, until you pop one whole in your mouth, where that musky green-tea dusting acts as a gorgeously savory counterpoint to warm, zeppole-like dough. 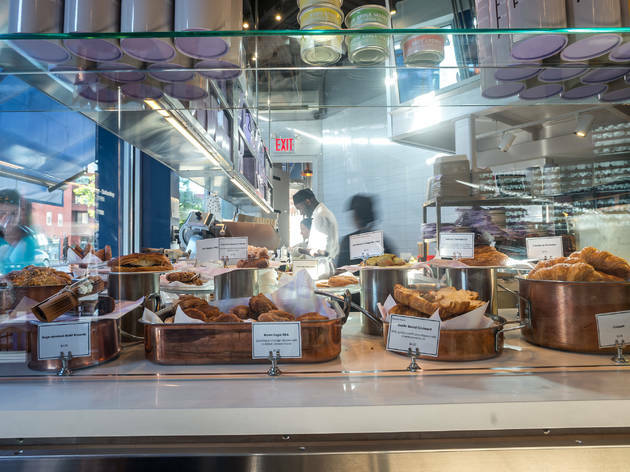 Ansel improves upon his own superlative kouign-amann, lacing the buttery, crusty beaut with brown sugar for a deep, molasses-like sweetness ($5.25), but it’s new creations like the spectacularly fudgy sage-smoked brownie ($4) and the EGG-clipse ($7.50)—a head-spinning blitz of squid-ink brioche, garlicky mashed potatoes, confit egg yolks and a blizzard of Parmesan—that make the Kitchen as much a destination as the bakery. 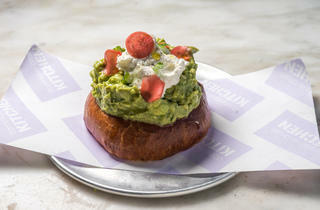 There are moments when Ansel’s loftiness creeps up and richness overwhelms—see the dictionary-thick extra-fluff mille-feuille ($7.75) or the towering avocado-edamame toast that would look more at home at a Super Bowl spread ($8.50). 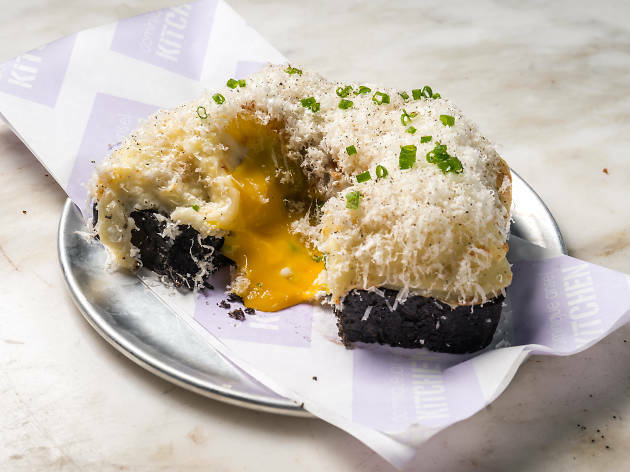 Excellence prevails, however, and though wayward Cronut seekers may be disappointed not to find what they came for, they should stay for nearly everything else. 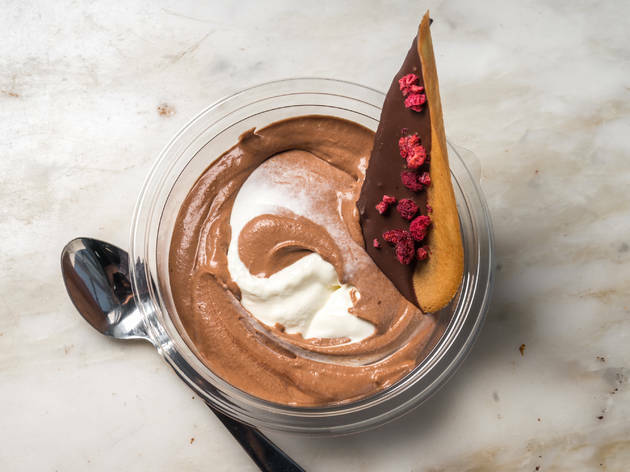 Average dessert: $7; tasting menu: $85–90. AmEx, Disc, MC, V.
There are no cronuts here but the creativity is still on full blast here. The ice cream during the summer is phenomenal and pretty much the main reason I go. The match beignets are great too. The stuff again is quite pricey but that's because fo the work that goes into some of these. I had a loaded chocolate croissant and it was way too much. Presentation wise, beautiful but didn't really capture me. 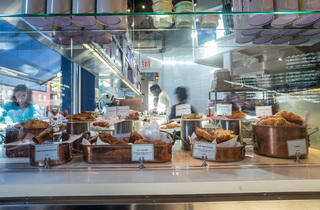 All in all, it's a cool pastry shop to go if you're in the area! As an avid ice cream aficionado, this was a summer bucket list stop when I heard about the burrata soft serve. Except I totally failed to realized that the soft serve window is different from the Kitchen's operation of hours. The upside in this saga? DKA ice cream sandwich. The DKA provides that nice crunch into your bite. The ice cream (cold brew coffee) was not too overpowering. If you have this, take a moment to savor your first bite and thank the ice cream gods for the greatness that has been bestowed upon you. PS- the kitchen does offer "real food" (not pastries or ice cream) but I was too distracted to have anything else. Because, duh. I was really excited to finally come here, and was sadly underwhelmed! 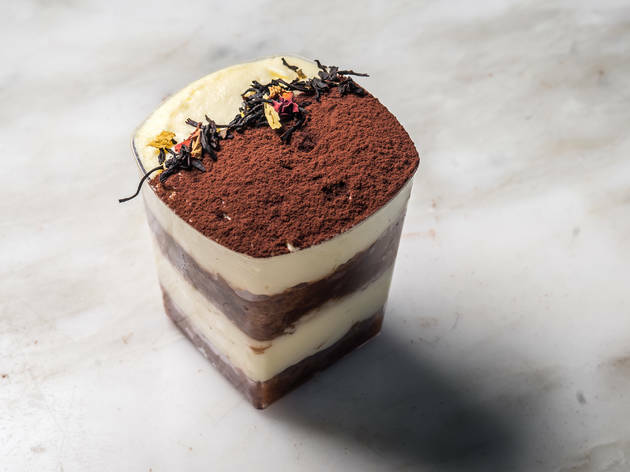 I ordered a tiramisu, but it was very sweet, with not enough coffee (odd, since the description says it’s soaked in coffee for almost a day). The custard on top was also too, too sweet. There were also hard chunks of *something* in the cake, I’m not sure what. My boyfriend, however, loved his cheesecake… but he just loves cheesecake. 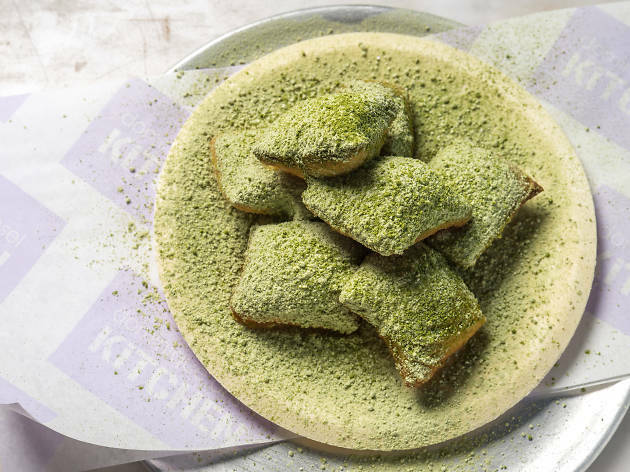 I’d come back to try other desserts (the matcha beignets look delicious! 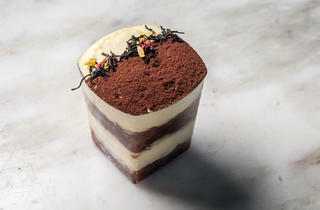 ), but I’m bummed by the quality of my tiramisu, one of my fave desserts. Whenever I think of a perfect cafe to relax at in the West Village, I'll now be thinking of DAK. I came here for a lite dinner with a friend and had a delicious (and surprisingly filling) meal. The brioche avocado toast was more avocado than brioche (just the way I like it), and the giant s'more we split for dessert had an amazing combination of cinnamon and bittersweet chocolate. Don't expect a lot of available seating when you visit, there are only a few tables outside, and most spots inside are meant for solo dining. Nevertheless - if you love cronuts, you'll love the offerings here!